All meters and stations will be cashless during the first year of operation, at which time the impacts of not accepting cash will be evaluated and Council will determine the best long-term approach. Exact payment methods will be known after the NRFP is awarded this spring. “Our ideal proposal will provide motorists a variety of payment options other than cash. For example, we would like to offer the option to pay with credit, debit, pay by phone and we are also looking at upgrading the ParkCard to the Metrobus M-card system in place today,” explained Councillor Hanlon. Smart Cards such as M-cards use digital currency or credit and are currently used in other municipalities in Canada as a method of payment for transportation services. The cards are available for purchase and re-load at several locations throughout the city for Metrobus, and provide the option to re-load the card online using credit or debit. “By the fall of this year we will begin the installation of new pay stations and meters and will keep the public informed on exactly what payment options will be available as we move though the process,” said Councillor Hanlon. The NRFP also includes new software and hand-held equipment to enable e-ticketing, reduce paperwork, and allow future changes to paid parking permits as outlined in the strategy. The Paid Parking Management Strategy is a five-year plan and is available on the City’s website. Frequently Asked Questions are available in the attached backgrounder. 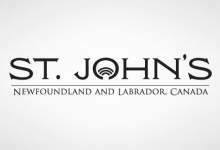 The NRFP will be available at 4 p.m. today at bids.stjohns.ca.